Dawn raids without warning are the brightest "confirmation" of the statement delivered by Russian representative to the OSCE about wonderful life of the Crimean Tatars in the Crimea. Russian security forces searched the home of Renat Paralamov’s family in the village of Nizhnegorsk in the annexed Crimea, lawyer Emil Kurbedinov informed on Facebook. “In support of the words of the Russian representative who yesterday at the OSCE talked heatedly about the wonderful life of the Crimean Tatars in the Crimea, today a regular search was held in the family of the Crimean Muslims Crimean Tatars, (my colleagues and I call it an attack on houses). Maybe they found the killers Reshat Ametov, or kidnappers of Ervin Ibraimov, or maybe the kidnappers of Shaimardanov, Zinedinov or Arislanov and Dzepparovs or other kidnapped Crimean Tatars of Crimean Muslims, citizens ? !” The lawyer asks. A message on page Bint Ummah informed that yesterday Renat met his brother, who returned from the Hajj. Renat raises 4 small children, earns a living by trading in the market. “In one of the videos you could see it. He gave an interview about the importance of fasting during Ramadan and the possibility of combining it with work. He spoke neither about separatism, nor about ISIS, not even about Russian power. He has no previous convictions. Neither a criminal past, nor a criminal present. He did not call to anything, did not do, disseminate or store anything of threatening nature. Please meet. He is the "Terrorist". Why? Well, just because.” The message said. Following the Russian annexation, mass searches of independent journalists, civil activists, activists of the Crimean Tatar national movement, members of the Mejlis of the Crimean Tatar people, and Crimean Muslims suspected of links with the Hizb ut-Tahrir organization banned in Russia have increased in Crimea. 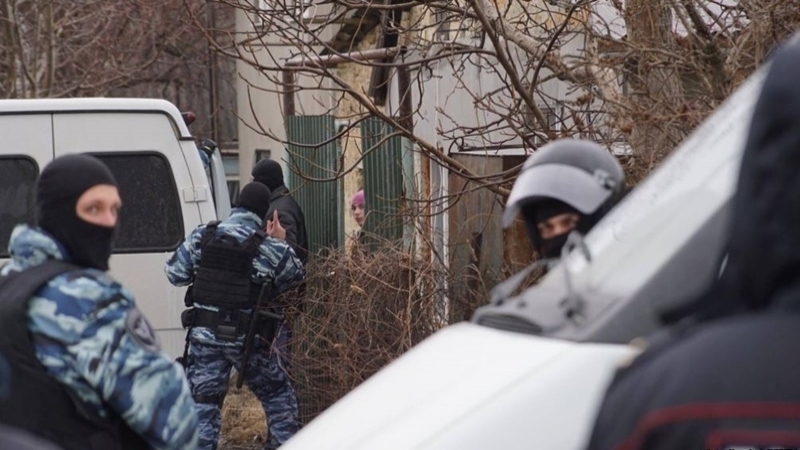 Earlier, August 10 in the village of Novoklenovka in Belogorsky region in Russian-occupied Crimea as a result of searches of Crimean Tatars, the occupants detained 4 people. All detainees were men from the same family. The security forces treated them rudely, intimidated women, forbade the use of mobile phones.